Jets’ Burning Question: When’s Tebow Taking Over? The Jets' season begins Sunday at home against the Buffalo Bills. 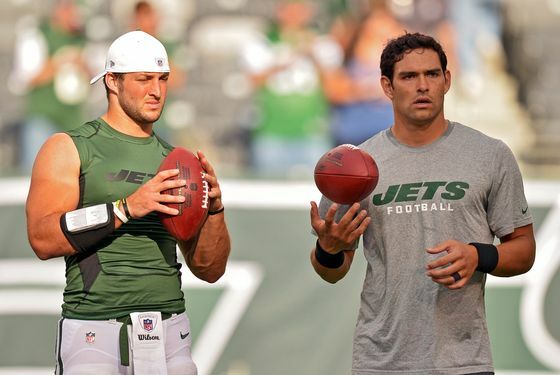 Until then, you should read our big Tebow-Sanchez package. And you should also stay here as we look at the Jets' biggest concerns heading into the season. Today: Okay, more on Tebow and Sanchez. It is an article of faith that, at some point this season, Tim Tebow is going to start a game at quarterback for the Jets. This presumes either a Sanchez injury or a losing streak (or both), which is something many people are presuming for the Jets this season. At this point, it would be a major upset if Sanchez doesn't lose the job at some point. But that, in Sanchez's eyes, is the dumbest thing imaginable. Sanchez is the only person, including Tebow, who doesn't think he's involved in a quarterback controversy. The only way he'll be proven right is if he wins. Regardless of Tebow's presence, Sanchez was going to have to win this year, or the Jets were gonna have to go another direction anyway. (Presumably, though the Jets' patience with Sanchez sometimes knows no bounds.) So this season shouldn't be more different for Sanchez than any other. But it is — oh, it is. Because if Tim Tebow ends up starting a game, for whatever reason, and wins it, particularly in comeback fashion ... well, people will forget Mark Sanchez was ever the quarterback. Sanchez does probably know this. Which is why he'll be doing everything in his power not to lose the job in the first place.